DENVER, CO, UNITED STATES, April 2, 2019 /EINPresswire.com/ — Over one million people attempt suicide in the United States each year; tragically nearly 50,000 die. Today, an American is more at risk of dying from suicide than from an automobile accident, and more than twice as likely to die of suicide as homicide, war and terrorism combined. Suicide isn’t just a mental health issue. It's a matter of public health, and we must address it now. The American Association of Suicidology (AAS) is dedicated to saving lives and in healing those affected after a loss. 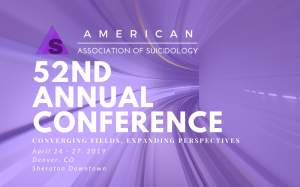 In the service of its mission, AAS is sparking a cultural shift to create solutions at its 52nd Annual Conference at the Sheraton Hotel Downtown, in Denver, Colorado, April 24 – 27, 2019. The conference theme, ‘Converging Fields, Expanding Perspectives,’ will pull from diverse views across disciplines and countries, allowing us to find innovative ways to work together. A presentation from former U.S. Surgeon General, Dr. David Satcher, will focus on how America moved from despair to solutions with HIV/AIDS and what we can learn from this perception shift in the effort to help during a suicidal crisis. We expect neurobiology, sociology, social psychology, economics, and primatology to collide with Stanford’s Dr. Robert Sapolsky’s talk, and get an inside view from the media with Jennifer Ashton, MD, physician, author, and ABC TV correspondent. AAS will feature one of the most diverse line-ups in its 50 year history across two moderated debates, eight thought-leader discussions, and 12 inspiring TED-style talks. “By working together we’ve put a man on the moon and cured polio; together, we’ll start on a journey beyond anything we’ve imagined and the first steps to eradicating these tragedies of suicide,” said David Covington, LPC, MBA, incoming President of AAS. As we contemplate the boundaries of our knowledge and understanding of suicide, it is becoming clear that our field is in need of a breakthrough. To encourage the development of new ideas and approaches, this conference will include presentations from a variety of academic and professional disciplines, including anthropology, biology, behavioral economics, philosophy, psychiatry, psychology, public health, social work, sociology, theology/religion, media and entertainment, and evolutionary theory. The press kit outlines some significant opportunities and presenters at this year’s conference. The full registration program booklet can be found at www.suicidology.org/Annual-Conference/52nd-Annual-Conference. About AAS: Founded in 1968 by Edwin S. Shneidman, PhD, AAS promotes suicide as a research discipline, public awareness programs, public education and training for professionals and volunteers. The membership of AAS includes mental health and public health professionals, researchers, suicide prevention and crisis intervention centers, school districts, crisis center volunteers, survivors of suicide loss, attempt survivors, and a variety of lay persons who have in interest in suicide prevention. You can learn more about AAS at www.suicidology.org.